A comforting dinner for a cold winter night w/ friends. The bean stew tasted better than it looks in the photo. 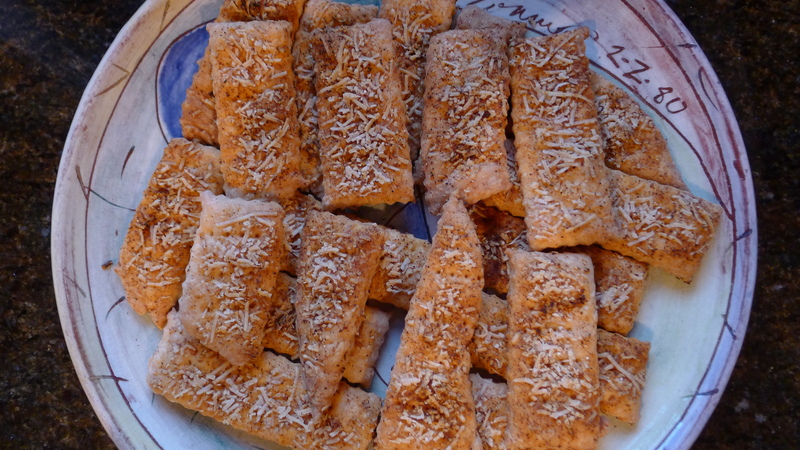 There was no time for food fluffing… I had party guests arriving at any minute! 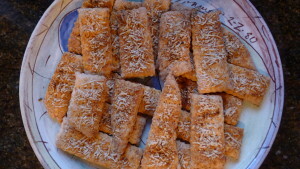 Kalamata rather than Castelvetrano olives were used. I browned some ham chunks for the non-vegetarians to add to their stew if desired. The stew recipe also called for garlic rubbed rustic bread toast which I substituted w/ the spiced pastry crisps. They’re very easy to make… just roll out some pastry/pie dough, cut into slivers and sprinkle w/ harissa spice blend and freshly grated parmesan, then bake for 30 minutes at 350 degrees F.
Bartlett pears were used for the tart although after grocery shopping I learned they are not the preferred choice for baking. Supposedly they don’t hold up well when baked, but the tart turned out fine. 1) Smash garlic cloves w/ the flat side of a chef’s knife. 2) Heat olive oil in a large dutch oven, add garlic and cook over medium heat, stirring often, until golden (approx. 5-7 min.). 3) Add onion and fennel, season lightly w/ salt, cook, stirring often, until onion is translucent and onion and fennel are browned around the edges (approx. 10-15 min.). 4) Add lemon zest, rosemary and red pepper flakes, stirring often, until rosemary is very fragrant (approx. 3-5 minutes). 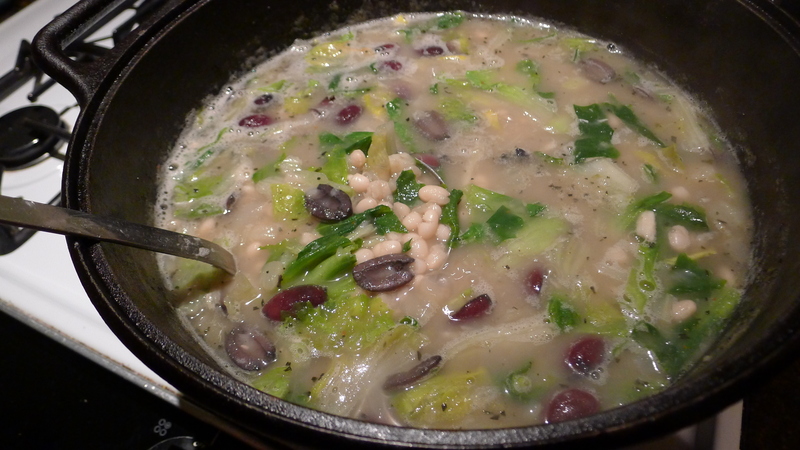 5) Add bay leaves, beans, 1 teaspoon salt and 12 cups of water; bring to a simmer. 6) Partially cover pot, reduce heat to low, and gently simmer stew until beans are creamy and tender all the way through (approx. 60-80 minutes). 7) Add olives to stew, then add escarole in batches, letting it wilt slightly before adding more; simmer until escarole is tender (approx. 3-5 minutes). 8) Pluck out bay leaves, adding more salt if necessary (keeping in mind the feta is salty, so don’t over season). 9) Serve stew w/ feta and spiced pastry crisps on the side. 2) Roll out 1 disc of dough so that it’s large enough to line a 10 inch tart dish. Carefully place dough into tart dish by rolling it up on rolling pin and unrolling into dish and letting it settle into corners – don’t press or stretch dough to avoid shrinkage while baking ; evenly trim excess dough from edges of dish. 3) In a bowl, add sugar and lemon juice, then add pear slices and toss so that all slices are coated w/ the lemon/sugar mixture. 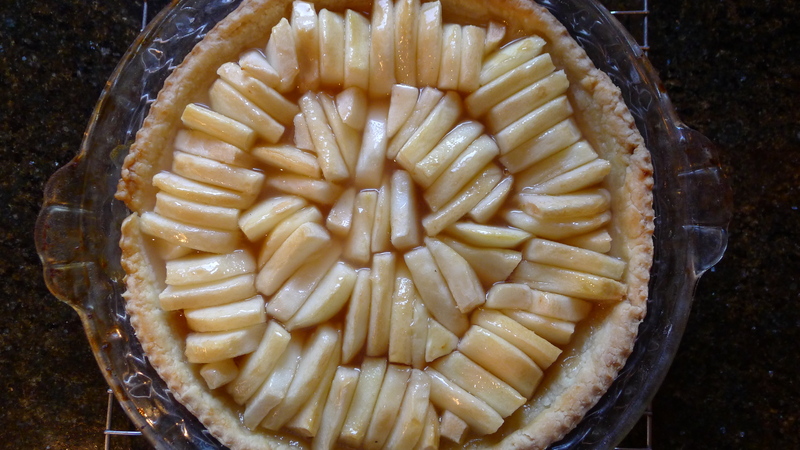 4) Arrange the pear slices in concentric circles on the tart dough as neatly as possible. 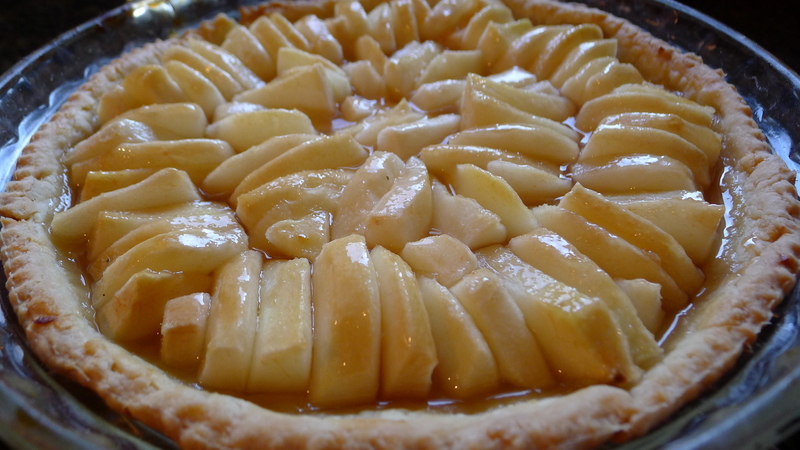 5) Place tart on middle rack in oven and bake until crust is a nice golden brown (approx. 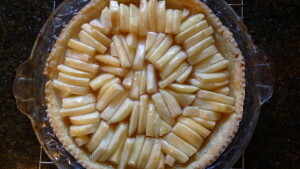 50 minutes); rotate tart in oven halfway through for even baking. 6) While tart is baking, place quince jelly and 1/8 cup water in a small pot and cook over low heat to dissolve and thicken into a syrup consistency. 7) When tart comes out of the oven, evenly brush quince glaze onto the pears. 8) Serve tart warm or at room temperature (w/ a nice snifter of Armagnac to warm you and your guests up on a cold winter night!). Yield; 6 to 8 servings depending on how you slice it!